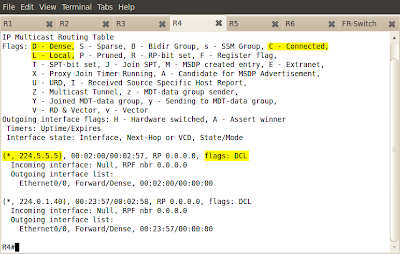 Configure R3 in such a way that the interval between full table walks is 10 seconds (not 5 which is default). 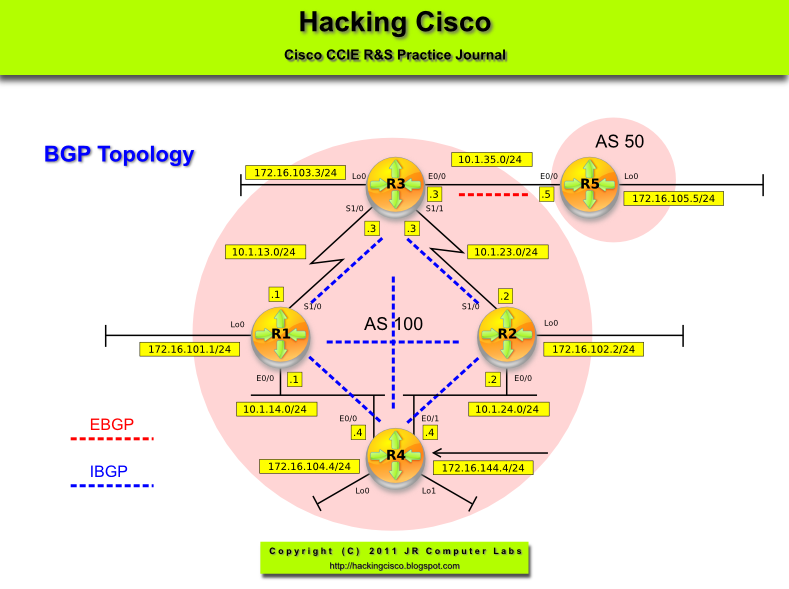 The BGP Support for Next-Hop Address Tracking feature is enabled by default when a supporting Cisco IOS software image is installed. BGP next-hop address tracking is event driven. 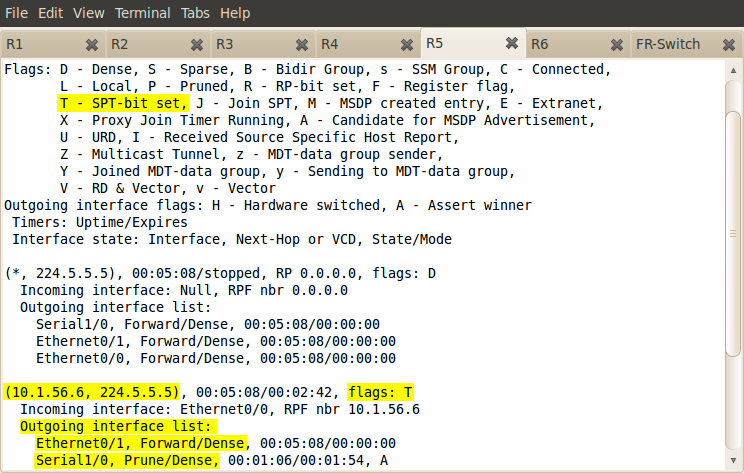 BGP prefixes are automatically tracked as peering sessions are established. Next-hop changes are rapidly reported to the BGP routing process as they are updated in the RIB. This optimization improves overall BGP convergence by reducing the response time to next-hop changes for routes installed in the RIB. 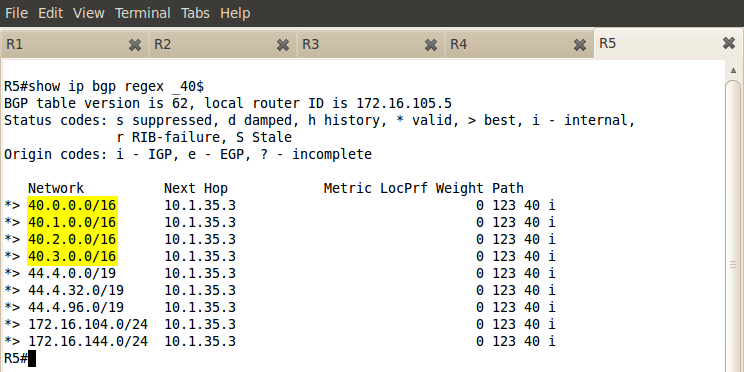 When a bestpath calculation is run in between BGP scanner cycles, only next-hop changes are tracked and processed. Configure R5 in such way, that if BGP in R3 does not support 'Route Refresh' message, it can still apply inbound policy without asking R5 to re-send their BGP prefixes. Pic. 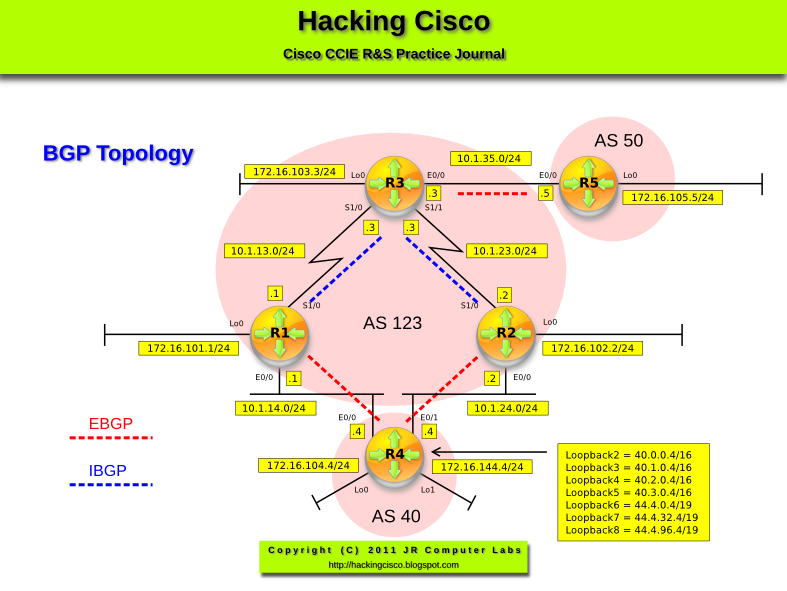 2 - BGP Before Applying Configuration. Pic. 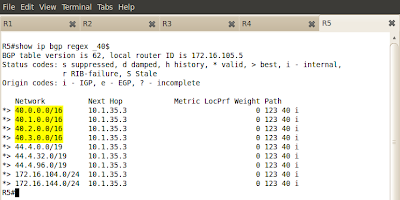 3 - BGP After Applying Configuration. 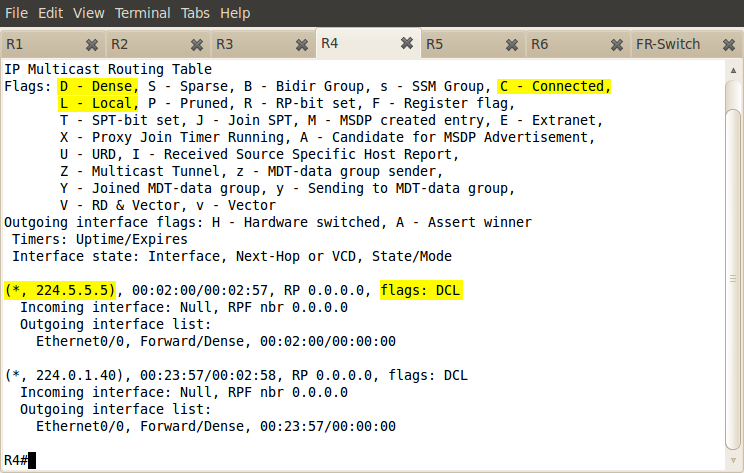 This command creates the exact copy of the BGP table. This causes high memory utilization but allows to apply inbound filtering on R5 without tearing down the session if the Route-Refresh messages are not supported on R5. R5 should filter out all class A prefixes starting with 40.x.x.x. Configure routers in such a way that changing the inbound filtering policy on R5 should force R3 to apply the right filtering preventing it from sending prefixes R5 does not wish to receive. Pic. 2 - Outbound Route Filtering Negotiated between R3 and R5. ORF has been enabled and supports prefix-lists only (as of writing this post). Now, I can apply the prefix-list based filtering as per Task 1. Pic. 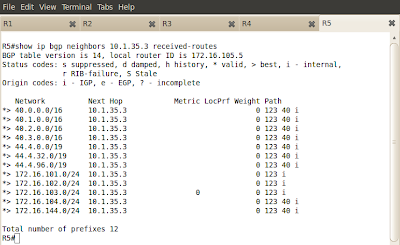 3 - BGP Table on R5 Before Filtering. Pic. 4 - Prefix-List Applied on R5. 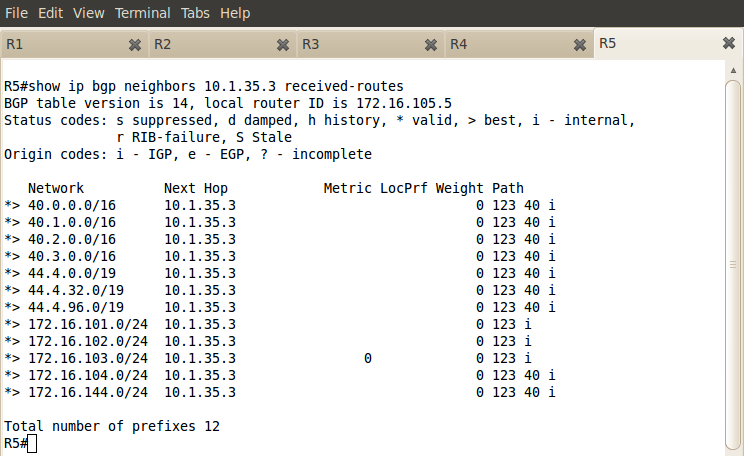 Now, 'clear ip bgp * in' on R5. 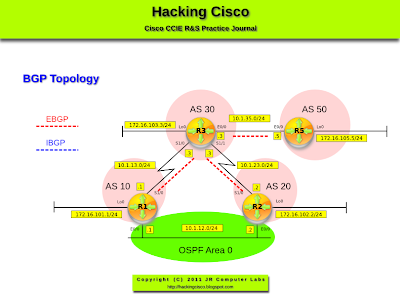 Configure authentication between R3 and R5 (use password: 'CISCO123'). 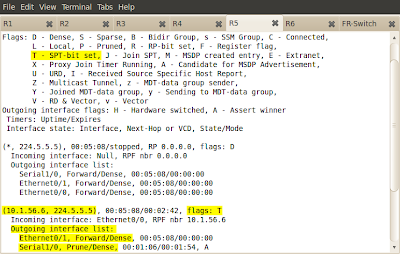 Configure the BGP timers: hello=30 seconds, holdtime=90 on R3 for all its iBGP peers. R3's iBGP sessions should inherit the same password. Do not use 'neighbor <address> password' command in R3 to accomplish your goal. R1 and R2 and R5 can use this command. The configuration stipulates that iBGP current and future policy in R3 should be configured as a template. 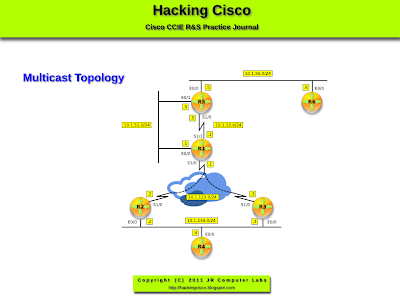 Configure authentication between R3 and R5 (use password: 'CISCO123'). 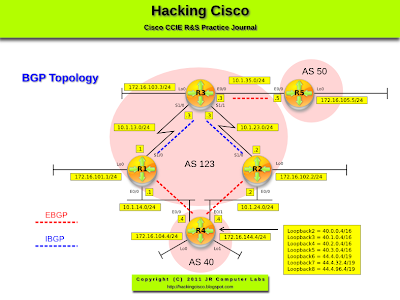 Configure the BGP timers: hello=30 seconds, holdtime=90 in R3 for all its iBGP peers. R3's iBGP sessions should inherit the same password. Do not use 'neighbor <address> password' command on R3 to accomplish your goal. R1 and R2 and R5 can use this command. The configuration stipulates that iBGP current and future policy in R3 should be configured as a template.